I flew to Cleveland, Ohio over the weekend and wanted to clear up some things that I read on the net about the plane that I took - the Embraer RJ145 Jet via Continental Airlines. Before I took the trip I looked up what kind of jet I would be flying in and I found that it was going to be the rather small Embraer RJ145 Jet. I searched the jet and found a few comments floating around that I had to clear up. 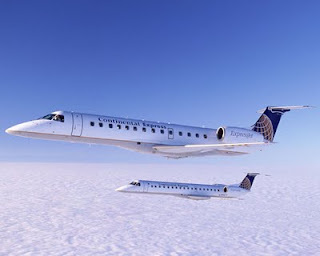 The Embraer RJ145 is a small jet, two isles, one seat on one row and two seats on the other - but don't let this freak you out - the ride is smooth and comfortable, and the staff at Continental Airlines was friendly and prompt. There was NO significant difference in the turbulence when compared to other large jets, despite many posts that there was more turbulence. I flew on the Embraer RJ145 on the way to Cleveland and on the way back and both trips were very smooth and the pilots got us to our destination early both ways.